I approach this review with some trepidation. Exogene is a hell of a science fiction novel but to call it a sci-fi novel is to undersell it. It is a hell of a war novel, but to call it a war novel is also underselling it. It really is the story of a woman finding out what it is to love, to be loved and to know where one stands with God -- in short, to be human. But that seriously undersells this book and makes a violent tale of war, genetic mutation and out-of-control science sound like some piece of warm and fuzzy chick lit. Exogene is certainly not that. So, what is it? First things first -- Exogene is the second book in a series by T.C. McCarthy. Read the first book, Germline, for the background necessary for this book. Germline explores a future war for trace metals in Kazakhstan between the Russians and the Americans. In Germline a group of cloned teenaged female warriors are introduced to the front line (males are not used because they lose control and become too violent). Exogene is the story of one of those warriors. The clones are supposed to fight for two years and then they begin to break down mentally and physically and, finally, they are rounded up to be killed. While they are maturing, they are indoctrinated into a culture of violence and death. Their universe is ruled by a god that rewards killing, rewards dying in battle and despises fear and mercy. In short, these teenaged girls are bred and trained to be pitiless fighting machines -- except they are not machines. Deep down, they are people... and Exogene is the story of Catherine, a clone soldier that decides she does not want to die when her two years have expired. She questions everything -- her religion, the orders she receives and especially the expectation that she is to give up and die because her two years are up. Exogene is read by Bahni Turpin. She was not the reader for Germline, the first book in the series. I really enjoyed the narration in that book but it makes sense for this book to be voiced by a woman since it is, after all, the story of a young woman. Her style emphasizes the fact that Catherine is a teenager. One of her companions even has a "valley girl" accent, which threw me for a while. When you hear that accent you think about shopping malls, stylish clothes and lots of makeup. You don't think about clone soldiers bred to kill. The dichotomy was unnerving and reinforced McCarthy's larger themes. Readers are taken far from the battlefields of Kazakhstan into Russia, into North and South Korea and beyond. 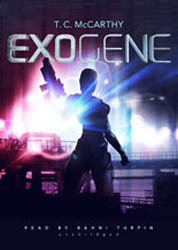 The world of Exogene is seriously screwed up -- damaged by nuclear war, cloning soldiers and experimenting with human/robot hybrids. Through it all, Catherine pushes along: experiencing, thinking and learning what it is to be human.